WASHINGTON (CBSMiami/AP) – The Marlins led in the seventh inning and again in the eighth. Both times, they lost it. Washington remained under .500 after rallying past the Miami Marlins 6-4 Monday night, yet it might not be long before this team lives up to its preseason hype. “This is the team I’ve waited for,” Yunel Escobar said through a translator. Escobar had a career-high five hits, and the Nationals combined solid pitching with timely hitting to carve out their sixth victory in seven games. Jordan Zimmermann kept the game close for seven innings, and former starter Tanner Roark sealed the win with his first career save. Better yet, the Nationals banged out 12 hits and overcame a 4-2 deficit in a four-run eighth. “It gives them confidence that they’re not out of a game, which is a good thing,” manager Matt Williams said. In his relatively short MLB career, Tanner Roark has already gone from afterthought prospect to surprise bullpen contributor to a 15-win starter and now back to relieving, somehow finding success at each stop. The former 25th round pick who lost 17 games at Triple-A the year before he debuted has become a baseball renaissance man. Ask him to do just about anything and he will do it well. But before Monday night, there was one thing Roark had not done. He’s been excellent in middle relief, long relief, setup situations and as a starter, so what about closing? Sure, why not. Roark finally got the opportunity to save a game in the Nationals’ 6-4 win over the Marlins on Monday night due to closer Drew Storen being unavailable. Storen had pitched on consecutive nights, so Matt Williams needed somebody to step in. MIAMI (AP) — With a dazzling young core and some veteran leadership, the Miami Marlins’ current hot spell is a realization of the success many envisioned heading into 2015. 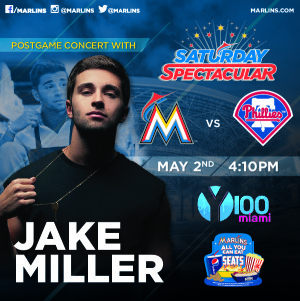 An ongoing influx of offense can help the Marlins further distance themselves from last place in the NL East, a spot now owned by the offensively challenged Philadelphia Phillies as they head to Miami on Friday night. Miami (10-12) has won seven of eight to rebound from a rough start to the season that included three losing streaks of three or more games. The Marlins have scored 5.5 runs per game over the hot stretch, up from 3.79 through April 21. Giancarlo Stanton and Adeiny Hechavarria have paced that effort with nine RBIs and eight runs apiece over the past eight games, while Stanton has three home runs and Hechavarria is 13 for 29 (.448). MIAMI (CBSMiami) – After a rough start to the 2015 season, the Miami Marlins are starting to look like the playoff contender that many thought they would be. The Marlins defeated the New York Mets on Wednesday night, their seventh win in eight games and third consecutive series victory. As if the on-field resurgence isn’t good enough news for Miami, the team received another reason to be optimistic about their playoff chances on Thursday. Jose Fernandez, the ace of the Marlins pitching staff, threw to live batters for the first time since undergoing Tommy John surgery last May. The session took place at the team’s Spring Training complex in Jupiter, Florida. Afterwards, Fernandez was all smiles. MIAMI (CBSMiami/AP) – Tonight marks the beginning of what should be a great NL East matchup. The New York Mets own the best record in baseball and have already swept a series from the Miami Marlins this season. It’s the Marlins, however, who are the hot team heading into this three-game series. Miami goes for a sixth straight win Monday night while the Mets attempt to rebound from a sloppy loss. New York (14-5) has won 12 of the past 15 meetings with the Marlins (8-11) after sweeping a four-game set at home from April 16-19. That sweep was part of the Mets’ 11-game winning streak, which came to an end with Friday’s 6-1 loss at Yankee Stadium. After posting an 8-2 victory Saturday against their crosstown rivals, the Mets committed four errors in Sunday night’s 6-4 defeat.